Millions of litres of water is leaking from pipes in Devon and Cornwall every day, South West Water (SWW) has admitted. 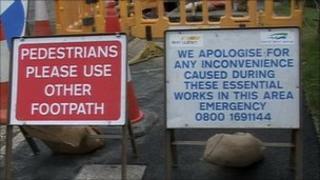 The company was criticised for taking five days to fix a leak from a burst mains pipe Hartland in north Devon. It said every day an average of 84 million litres of water leaks out of the system, but the recent cold weather has resulted in a 20% rise in leaks. SWW said it had a duty to prioritise the most serious first. SWW said since anti-leakage targets were first set in 1999, it has been an industry leader in terms of the fewest litres lost per day per kilometre of pipe. The company aims to fix mains bursts within 24 hours and "significant" leaks within three days, but spokesman James King said while he accepted 84 million litres "was a lot" prioritising was the right thing to do. He said: "We've got a very significantly sized network - 15,000km (9,320 miles) of pipe and clearly you'd expect some level of leakage of that size." But Hartland resident David Rowland said water customers were being penalised. "I'm not happy about it," he told BBC News. "Multiply this leak by the whole of Devon and Cornwall - there must be dozens of these every day. "Somebody's got to pay for it and we all know who that is - us." SWW said it had flow meters measuring water passing through 750 geographic zones it the region. These help it calculate where burst mains are and reduce the potential time lag between leak and repairs, which results in less water loss. Since privatisation in 1989, the company said it had reduced leakage by 60%.